Property Location Located in North Charleston, Quality Inn Coliseum is minutes from Charleston Tanger Outlets and North Charleston and American LaFrance Fire Museum. 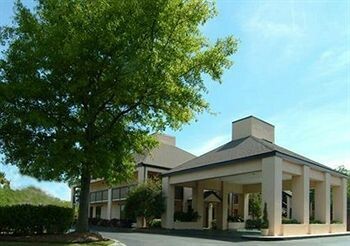 This hotel is within close proximity of Tanger Outlets and Charleston Area Convention Center.Rooms Make yourself at home in one of the air-conditioned rooms featuring refrigerators and microwaves. Complimentary wireless Internet access is available to keep you connected. Conveniences include safes and desks, and you can also request cribs/infant beds (complimentary).Rec, Spa, Premium Amenities Enjoy the recreation opportunities such as an outdoor pool or make use of other amenities including complimentary wireless Internet access.Dining A complimentary buffet breakfast is included.Business, Other Amenities Featured amenities include a business center, complimentary newspapers in the lobby, and a 24-hour front desk.